The AirPi is a Raspberry Pi shield kit, capable of recording and uploading information about temperature, humidity, air pressure, light levels, UV levels, carbon monoxide, nitrogen dioxide and smoke level to the internet. Now available on Tindie - click here to order! The AirPi can be very cheap - you can build a basic station for less than £50 (including the Raspberry Pi!) by only including the sensors you need. From the ground up, we designed the software and hardware for the AirPi to be modular. This means that it is really easy to add any sensors you find to your AirPi. More Information Build your own! AirPi located in Basingstoke, UK. AirPi located in Crozet, France. 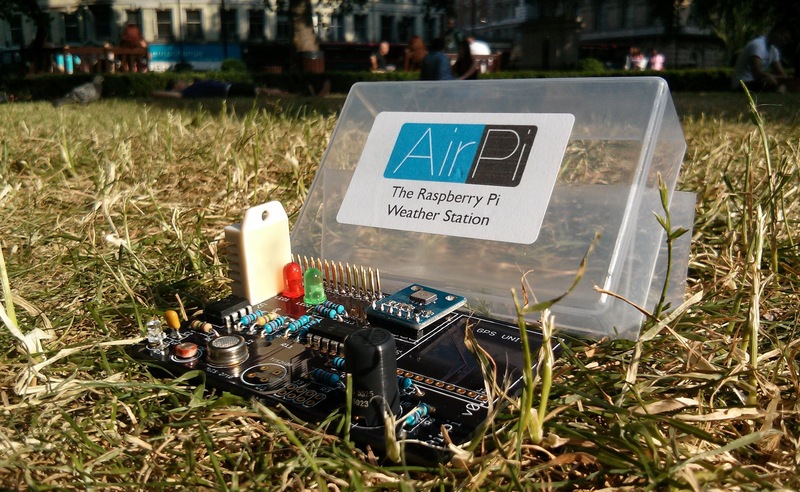 AirPi located in Hertford, UK. AirPi located in Riehen, Switzerland. AirPi located indoors in Winchester, UK. AirPi located in Louisiana, USA. AirPi located in Les Fragnes, France. AirPi located in St Petersburg, Russia. AirPi located in Toronto, Canada.